Our first paint recipe “Tropical Water” will be ready for release Australia wide to art stores later this year. Lucky you! You’re the very first to see it! Download your recipe card right here, and watch the tutorial that goes with it, to learn how to paint this gorgeous tropical water. Click here to download your Tropical Water recipe card! tutorial that goes with your recipe card! 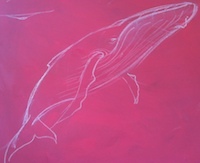 Using chalk is a great way to experiment on your paintings without the heavy commitment of actually applying paint! Use blue to create highlights on the backs of waves. Not sure about a yellow highlight on a tree? Chalk it in first. Not happy? Simply wipe off with a damp cloth. Easy! This is not just for teachers - but for beginners too. Check out Mark’s new, free 15 minute tutorial using student quality paints to create some lovely effects. Mark’s latest project involves not so much painting, but building a school for the gorgeous locals in Kagata Village, Solomon Islands. Want to be involved? Type "SOLS" in the comments box if you do. Still in the final stages of editing, this downloadable tutorial will show you how to paint a soft, intimate and moody dolphin family underwater. Price guide approximately AUD$20. Pre-order NOW for your 20% discount when released! Type "VLOG" in the comments box. This informative website - Empty Easel - is all about free art education online. Heavy on free resources, you should check it out for your own learning practise! Check out even more free online art education resources! While *ahem* “researching” apple images on a loose kind of education slash teacher-y theme via google today, I was very excited to come across this blog by Janett Marie. Gee people are awesome sometimes! If you’re as quirky as me (and I think you might just be) you’ll be immediately intrigued and visually delighted by her gorgeous teeny tiny 100 apple paintings! Janett Marie’s apples are pretty darn special! "This painting was done as a request from a friend. I received a couple of photos of my friend but that wasn't a problem because I had access to her Facebook for photos. 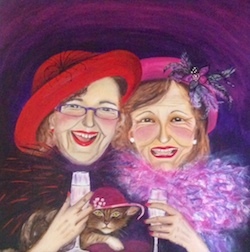 Her friend (who the painting is for - a surprise birthday present) is on the left. I was given a photo which was difficult to work with, but then I was given a better photo of her, so I adjusted the facial features using gesso and restarting the upper part of the face to correct the likeness. Much better! The original photo was a very early photo of her…hence a more recent one was needed! Note: this is character and not a realistic portrait, and I got my inspiration from Shelly Wilkerson for this painting. I had problems getting the champagne glasses to look correct. That is, the colour of the top part of the glass and the bottom. 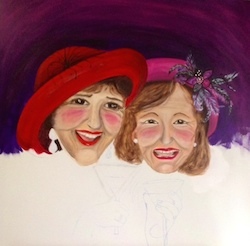 I needed to have my background colour showing, whilst also showing champagne in the glass. After some suggestions from Mark I was on my way! 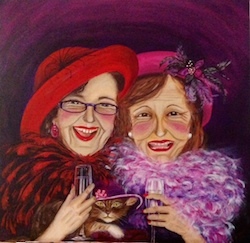 My customer is very, very happy with the final painting - which of course is wonderful! I painted when I was in my teens. My father was my mentor and critic who put me through art lessons. My father died when I was 21 and I stopped painting. I took it up again in 2012 at the age of 57! To my surprise I surged in painting and haven't stopped since. Just love it. My paintings are on display at my local cafe "Cafe De Parry" in Bull Creek, Perth. Also, on display during the year at the "Atwell Art Gallery" in Alfred Cove, Perth." 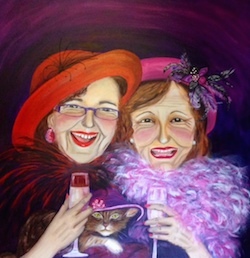 Thanks so much for sharing your painting journey with us Bernadette!